Have you noticed that *wmv files become less common these days? People prefer to watch videos on iPhone iPad and Android devices in MP4, FLV, MOV, AVI formats. Moreover, as its name mentioned, WMV, also known as Windows Media Video, is a compressed video compression format for several proprietary codecs developed by Microsoft, which is specified for Windows users. For Mac users, it's a little bit head-scratching, because only the following Mac programs can open WMV files in 2019: Microsoft Windows Media Player, Apple QuickTime Player (with Flip4Mac WMV Components) and Web browsers with Flip4Mac WMV plug-in. Then the question comes along as follow: how to convert WMV to MOV for QuickTime, import WMV to iMovie or convert to Final Cut Pro on Mac? How to convert WMV to FLV for YouTube and other video sharing website? How to convert WMV to MP4 Mac for playback on iPod, iPhone, iPad and other portable devices? Free download best-ever WMV video converter for Mac to convert WMV to MP4 MOV M4V MKV AVI FLV MP3 etc. for playback on iPhone iPad Android devices. To get all problems solved, the best Mac WMV video converter for 2019, MacX Video Converter Pro is a overwhelming choice for converting WMV files. It features converting WMV video to MOV, WMV to FLV, WMV to MP4, etc. vice versa with high conversion speed and stunning output quality. Free download the best WMV converter on Mac and launch it. Then click "Add Files" button to import WMV files. Select the output video you desire. You may choose "to SD Video" firstly, under this category, you may find specified video format you needed, choose "to MP4", "to YouTube (FLV)", "to MOV" etc. Step 4: Start converting WMV to MP4 MOV MKV, etc. Click "RUN" button and this top video converter for Mac will start converting WMV video files. You can view the conversion progress and cancel the converting process at anytime. Note: This Mac WMV video converter can convert WMV video to all popular video formats for iPod, iPhone (iPhone XS/XR/X/8/7/6S), iPad (iPad Pro/mini 4), PSP, PS4, Apple TV 4, Zune, Creative Zen, Xbox and so on. If you don't know what formats your device supports, you can just select the format according to your device's name. 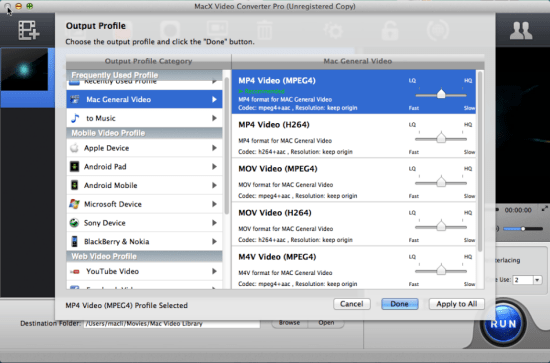 As a versatile Mac video converter software, MacX Video Converter Pro not only converts WMV video files, but also does support among a wealth of HD & SD video formats, including MKV, M2TS, MTS, AVCHD, H.264/MPEG-4 AVC, AVI, MPEG, MP4, WMV, MOV, FLV, RM, RMVB, WebM, Google TV, and many more. No matter you need to convert WMV files to MP4, MOV, AVI, FLV, MKV etc. 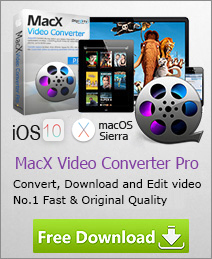 on Mac OS X or Windows, do not hesitate to turn to MacX Video Converter Pro. Eager to play WMV on Mac OS? This guide is mainly about 3 feasible solutions to watch windows media videos on Mac OS X (Yosemite included) effortlessly with WMV players for Mac. Looking for WMV player Mac to play WMV files on Mac? This guide introduces you top useful & functional Mac WMV players to play WMV files on Mac with ease as well as how to convert WMV to MOV/MP4 to be compatible with Mac.